This is without doubt our most popular guided trip - designed to be appreciated by both experienced paddlers and beginners alike, with the emphasis on fun and enjoyment - not hard work. 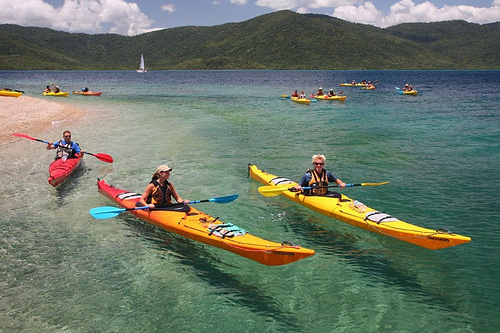 Departing from our base at Shute Harbour, we kayak over fringing coral reefs and explore nearby tropical islands. These turquoise waters and islands are home to an amazing diversity of marine and bird life including giant sea turtles and soaring eagles. Between the months of July and September, there is also a chance to encounter the magnificent humpback whales which arrive to give birth to their calves before returning to Antarctic waters. We stop off at White Rock, where there is time to swim, snorkel (mask,snorkel & stinger suit provided free of charge) or kick back and relax. We provide cold drinks accompanied by a cheese and a fruit platter, allowing you to refresh before our return to Shute Harbour. Top quality kayaks and equipment, snorkeling gear (mask ,snorkel & , stinger suits0, dry bags, snacks, a safety briefing and guide/s. Hat, sunscreen, towel, bottle of water, swimwear, shoes that are okay to get wet (thongs, sandles, deck shoes or similar are suitable).